RNA secondary structure prediction through energy minimization is the most used function in the package. We provide three kinds of dynamic programming algorithms for structure prediction: the minimum free energy algorithm of (Zuker & Stiegler 1981) which yields a single optimal structure, the partition function algorithm of (McCaskill 1990) which calculates base pair probabilities in the thermodynamic ensemble, and the suboptimal folding algorithm of (Wuchty et.al 1999) which generates all suboptimal structures within a given energy range of the optimal energy. For secondary structure comparison, the package contains several measures of distance (dissimilarities) using either string alignment or tree-editing (Shapiro & Zhang 1990). Finally, we provide an algorithm to design sequences with a predefined structure (inverse folding). Lorenz, Ronny and Bernhart, Stephan H. and Höner zu Siederdissen, Christian and Tafer, Hakim and Flamm, Christoph and Stadler, Peter F. and Hofacker, Ivo L.
With version 2.4 sliding-window structure prediction receives the constraint framework! Starting with this version, the sliding-window secondary structure prediction implementations as available through RNALfold, RNAplfold, and RNALalifold are constraints-aware. Thus, they can readily incorporate RNA structure probing data, such as from SHAPE experiments, etc. See the Changelog for version 2.4.0 for a complete list of new features and bugfixes. Version 2.3 introduces the unstructured domain extension of the RNA folding grammar! This extension adds RNA-ligand interactions, e.g. RNA-protein, for unpaired stretches in RNA secondary structures. The feature is easy to use through the command file interface in RNAfold. See the Changelog for version 2.3.0 for a complete list of new features and bugfixes. Version 2.2 is out! After almost a year without a new release, we are happy to announce many new features. This version officially introduces (generic) hard- and soft-constraints for many of the folding algorithms. Thus, chemical probing constraints, such as derived from SHAPE experiments, can be easily incorporated into RNAfold, RNAalifold, and RNAsubopt. Furthermore, RNAfold and the RNAlib interface allow for a simple way to incorporate ligand binding to specific hairpin- or interior-loop motifs. This version also introduces the new v3.0 API of the RNAlib C-library, that will eventually replace the current interface in the future. See the Changelog for version 2.2.0 for a complete list of new features and bugfixes. Version 2.1.9 is a major bugfix release that changes the way how the ViennaRNA Package handles dangling end and terminal mismatch contributions for exterior-, and multibranch loops. We strongly recommend upgrading your installation to this or a newer version to obtain predictions that are better comparable to RNAstructure or UNAFold. Please see the Changelog for version 2.1.9 for further details on the actual changes to the underlying energy parameters. For a long time, Mac OS X users were not able to correctly build the Perl/Python interface of the ViennaRNA Package. Starting with v2.1.7, this limitation has been removed, and the interface should compile and work as expected. Please see the Install Notes for Mac OS X users for further details. Since ViennaRNA Package Version 2.1.0 we have enabled G-Quadruplex prediction support into RNAfold, RNAcofold, RNALfold, RNAalifold, RNAeval and RNAplot. See the changelog for details. With the new release of version 2, we introduce the most recent nearest neighbor energy model for all free energy calculations. Additionally, most of the stand-alone programs included are now able to read FASTA formatted input data. This makes conversion of you data files, as necessary in previous releases, obsolete! Installing from sourcecode is the recommended way to get most out of the ViennaRNA Package. For best portability the ViennaRNA package uses the GNU tools autoconf, automake, and libtool and can thus be compiled and installed on almost every computer platform. See the INSTALL instructions for details. For those interested in contributing to the development of the ViennaRNA Package by sending patches that add functionalities or fix bugs, we provide access to the master branch of the ViennaRNA Package repository at github. The packages listed above are meant for installation in RedHat derived Linux distributions with enabled Extra Packages for Enterprise Linux (EPEL) repository. They should work without problems in distributions such as CentOS, RedHat Enterprise Linux, and Scientific Linux. Note: The Windows installer will not change the PATH variable of your system. In order to omit the path to the binaries while using the programs of the ViennaRNA Package, please add the path of your ViennaRNA Package installation directory to your PATH variable manually. First, for RPM based distributions, we use this SPEC file, originally written for Fedora, but meanwhile extended to work for at least the Linux distributions we provide binary packages ourselves. Second, our binary package for ArchLinux was generated using this PKGBUILD file, which is also part of the viennarna source package available through the ArchLinux User Repository (AUR). Third, the configuration files for our binary debian packages are included in the source tarball within the packaging/debian directory. This creates a file packaging/macosx/ViennaRNA-VERSION-MacOSX.dmg, where VERSION is the current version number. Our binary packages in the above section are mainly build using the openSUSE Build Service, while the Windows Installer is created using the MinGW cross-compiler and the NSIS install system. The MacOS X installer is build on a MacBook Pro. To investigate the impact of the new energy parameters used in ViennaRNA Package 2 we did a quite extensive performance analysis. Update: With the release of ViennaRNA Package 2.1.9 we re-ran all performance benchmarks. Now, except for the runtime analysis, the charts and data compare RNAfold 1.8.5, RNAfold 2.0, UNAFold 3.8, RNAstructure 5.7, and, additionally, RNAfold 2.1.9.
both in terms of prediction accuracy as well as in computation speed, i.e. runtime. Please note, that for this performance analysis we only compared thermodynamics-based approaches that rely on the Nearest neighbor energy model and solve the problem by Zuker's dynamic programming algorithm! Benchmarks for other approaches in RNA structure prediction can be found elsewhere in literature or in the web. Measurements were taken on an Intel Core2 6600 CPU running at 2.4GHz. Unfortunaltey, RNAstructure 5.7 was not able to predict an MFE structure for the 10000nt samples in a relatively small time frame and thus was omitted in the particular test. 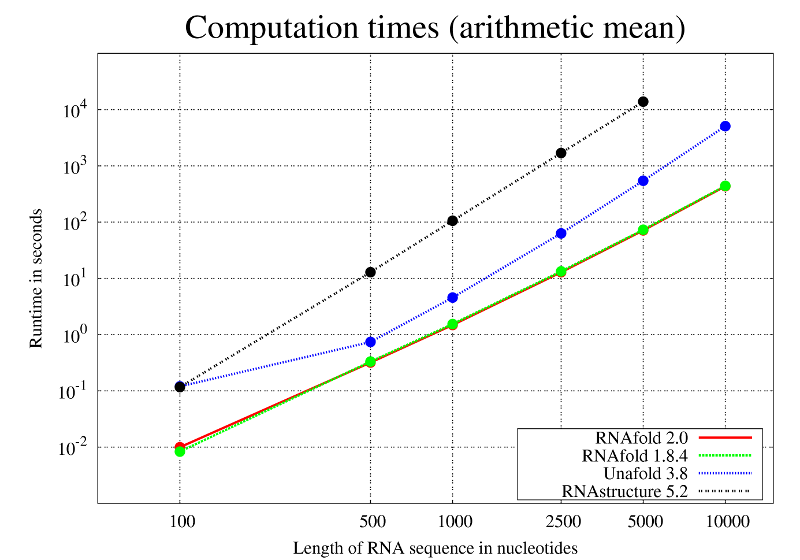 As visible in the computation times graph above, we observe virtually no difference in the runtimes of RNAfold 1.8.5 and RNAfold 2.0. This is also true for the memory consumption (data not shown). Update: Runtimes for RNAfold 2.1.9 does not differ substantially to that of RNAfold 2.0. Although all programs in the test have the same asymptotic runtime complexity, the computation time analysis of RNAfold compares quite favorably to that of the competing implementations. The test set was based on a set comprising 1919 non-multimer sequence/structure pairs taken from the RNAstrand database (all without pseudoknots in the reference structure). Both versions of RNAfold were run with -d2 option whereas UNAfold and RNAstructure were run with default options. In the table below, the resulting arithmetic mean of each performance measure is shown. Furthermore, we did a bootstrapping analysis with 1000 iterations to estimate the 95% confidence intervals for the predicted measures. The cumulative distribution of the MCC shows that RNAfold 2.0 (represented by RNAfold 2.1.8, and RNAfold 2.1.9) outperformes the other programs on the test dataset: more of its predictions are within the region of higher performance values. However, a detailed look at the performance among different RNA classes in our test set reveals that it differs widely. No single implementation tested provides consistent superiority of results. ./configure NVCC_PATH=/path/to/cuda/bin NVCC_SAMPLES=/path/to/cuda/samples CUDA_SMS="35 50 61"
where CUDA_SMS is a string specifying the CUDA compute capabilities. Here we include support for for Tesla K20, GTX745, and GTX 1060. For all CUDA related environment variables, check the output of ./configure --help. Some answers to frequently asked questions can be found at W. Langdons CUDA RNAfold website. Just click on the version numbers below to display the corresponding ViennaRNA Package releases.